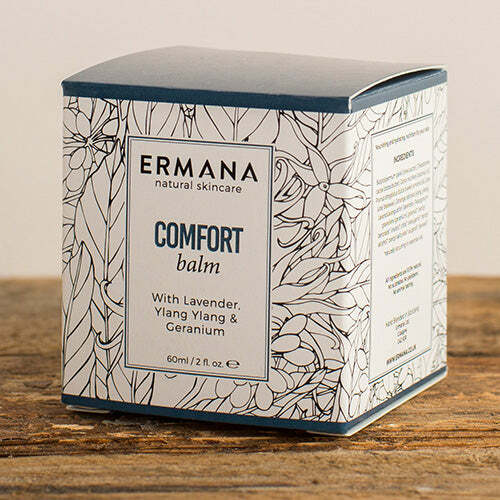 Our comfort balm is an intense hand cream made from a rich blend of natural butters. It is rich in vitamins and anti oxidants which hydrate, condition, soften and protect the skin. 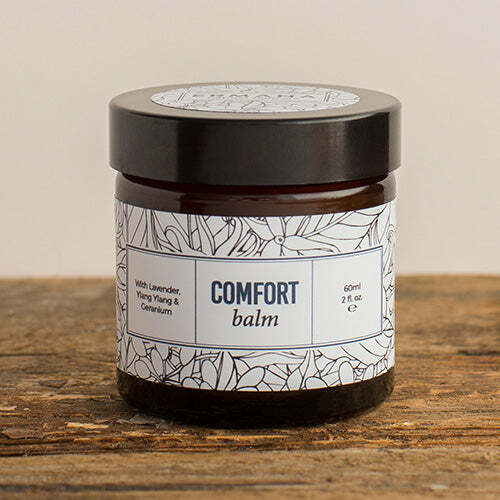 A versatile balm for areas in need of comfort – face, body and mind. Use on dry skin patches, chapped lips, cracked heels, elbows and knees. Softens rough, dry cuticles and hands. Massage into your wrists and temples and breathe deeply. Made from Cocoa, Shea and Coconut butters. Blended with sweet almond oil and beeswax and infused with pure essential oils lavender, geranium and ylang ylang. Lavender is without doubt the most versatile oil. It is a calming, soothing and balancing oil which can help restore imbalance in both body and mind. It works well to soothe skin disorders such as psoriasis. It inhibits bacteria which can cause skin infection and helps to balance oily skin. Lavender is a great anti-wrinkle treatment and is also commonly used to speed up the healing process of wounds, cuts, burns, and sunburns because it improves the formation of scar tissues. Geranium oil has a rose like floral scent and is often used in skincare for its astringent and antiseptic properties. It balances the skin making it ideal for both dry and oily skin. Geranium also has a stimulating effect on the lymphatic system meaning that it’s ideal for the treatment of cellulite and will help the body eliminate excess fluids. Ylang Ylang oil has a lovely delicate floral fragrance and was originally used in medicine as an antidepressant due to its uplifting effect on mood. It is extremely effective in maintaining moisture and oil balance of the skin and keeps the skin looking hydrated, smooth, and young. It works to balance both the body and the mind. DIRECTIONS – warm a small amount between the fingertips until balm melts and apply to areas in need of some comfort. Can be applied as often as needed. Don’t apply to broken skin. INGREDIENTS – Shea butter (Butyrospermum parkii ), Cocoa butter (Theobroma cacoa ), Coconut oil (Cocos nucifera), Sweet almond oil (Prunus amygdalus dulcis), Beeswax (Cera Alba), Lavender (Lavendula angustifoli), Geranium oil (Pelargonium graveolens), Ylang Ylang oil (Cananga odorata).